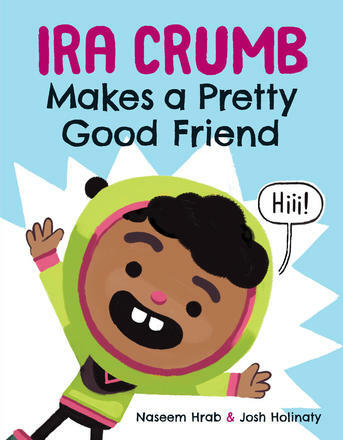 Ira Crumb Makes a Pretty Good Friend is the debut picture book by Naseem Hrab, illustrated by Josh Holinaty. And amidst all the great reviews the book has been receiving, consensus seems to be this: the book is funny. And the only thing we like better than a funny picture is...five picture books? In this list, Naseem Hrab recommends some of her favourites. I love funny. Funny people, funny shows, funny movies. And I especially love funny picture books. Funny picture books can be the most rewarding type of book to read aloud because it can only take a handful of words and a single expressive illustration to make a child laugh hysterically. I’m not a fan of pandering to kids—I’m a fan of sharing more sophisticated forms of humour with kids. And what’s better than sharing a laugh? Lots of things! Like sharing your cheesy sandwich with your old friend Naseem. What do you mean you already ate the whole thing? Sigh. It’s not like I was about to share a whole list of my favorite funny picture books with you or anything … It’s not like I’m really hungry. No, don’t worry about me … I’ll just eat one of these books. I love this book. My brother loves this book. His son loves this book. (Serious question: Is humour contagious or genetic?) 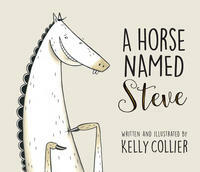 Packed with laugh-out-loud asides and featuring the most fallible horse in Canadian children’s literature, A Horse Named Steve tells the story of a fine horse who wants to be EXCEPTIONAL. Good thing he finds a random golden horn in the forest! That will certainly make him exceptional, right? Nothing could possibly go wrong! Special shout out to Bob the Raccoon for always keeping it real. How do you take power away from something that terrifies you? You laugh at it! (And then you cry.) 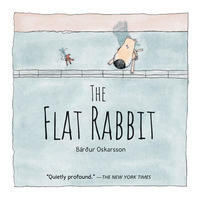 In The Flat Rabbit, a dog and a rat chance upon a flattened, dead rabbit on the road. Roadkill in a children’s book? You betcha! But wait, there’s more! After the dog and rat contemplate the rabbit’s existence, they find the best way they know to honour the rabbit—by attaching her to a kite! While this book tackles big questions about existence and death in one of the most seemingly absurdist ways possible, it also handles these subjects with sensitivity and compassion. Kite flying, anyone? I like my humour balanced with a bit of darkness, so Friend or Foe? is a big favourite in my house. (Aside: My house contains only me.) Night after night, a lonely mouse in a small house stares up at the cat in the palace tower. Does this make us friends? he wonders. Soon he finds his way into the palace and climbs up to the tower, where the cat sits on the windowsill. Is the cat his friend? he wonders. After all, he wanted a friend.With one of these most tense, surprising endings I’ve encountered, I can’t tell if I’m laughing because it’s so funny or because I’m so relieved. MAYBE BOTH? 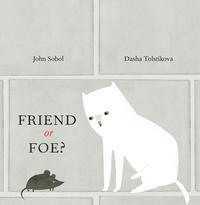 The third book in Jon Klassen’s Hat Trilogy is my favourite one in the series. In I Want My Hat Back, Klassen tells the story of a victim of hat theft. 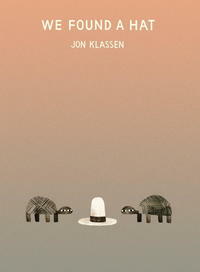 In This Is Not My Hat, Klassen tells the story of a hat thief. And in We Found a Hat, Jon perfectly captures what it feels like to covet something you can’t have. (Spoiler Alert: It’s a HAT!) Two tortoises chance upon a hat in the desert, they both try it on, they both look good in it, and they both can’t stop thinking about it. Sounds simple, doesn’t it? But it’s not! It’s existential and hilarious! Dark and yet so hopeful! I love a lot of things about this book, but what makes me laugh every time is the way those turtles stare at that fabulous hat.